With the goal to commence direct flights from the east coast of Australia to New York and London by 2022, Qantas has been working hard behind the scenes to determine not only which aircraft to use on the ultra long-haul routes, but what passenger really want inside the aircraft. Passenger satisfaction is the key to success for these flights so Qantas has been working with Sydney University’s Charles Perkins Center to conduct focus group research as well as analyse surveys collected from their non-stop Perth to London customers. Psychological and physical well-being is an extremely important factor on these flights, not only for the passengers but also for the crew members, so this is what Qantas has been working on. An area for a “sense of separation”, where passengers can zone out with virtual reality relaxation zones, audio mindfulness experiences or through a broader selection of entertainment. Designated zones to participate in gentle exercise/stretches, promoting circulation and comfort. Rather than being tethered to cords, offering wireless, noise cancelling headsets. A broad range of cabin areas across the entire aircraft such as seating and standing areas, sleeping areas, dining booths etc. An in flight cafe offering alcoholic and non-alcoholic beverages, snacks such as dips and chips and treat foods. Airlines such as Emirates already offer some of these onboard their aircraft, such as the bar area, which provides passengers with an area to socialize, relax and enjoy the beverages on offer by one of the cabin crew. Sam Chui has plenty of experience here, as seen in the image below. Frequent flyers are already jumping onto the wireless headset option as they can choose a device that comfortably fits and sounds good, allowing use all over the aircraft. With greater wireless capability making its way into aircraft too, broader entertainment options are already in the pipeline, with options for more movies, TV and personal work on your own device. As stated above, Qantas is working hard on the well-being and health side of things. The following list contains the top five initiatives already in place. Stretch classes at Perth Transit Lounge which last for 15 minutes and see passengers aged 12 to 75 getting involved. Over 80% of the total passengers onboard the Perth to London flights are said to participate. Outdoor areas to take in fresh air and natural light before being confined to an aircraft cabin. A specialized menu found in the lounge and aircraft to aid sleep and wakefulness. Specially designed aircraft lighting to promote wake and sleep times to help adapt passengers to the new timezone. Removal of the stopover, which adds stress and confusion. Additionally, by using the most advanced route planning and weather prediction research, traversing the aircraft on paths that save time using wind whilst remaining smooth. With all of this pinned up on the whiteboard, the next job for Qantas is to submit the ideas to Industrial Designer, David Caon to create a new set of features for the interior of the selected aircraft and future lounges. Neil Perry, the chef that designed the menu for the Perth – London flight and lounge as well as other areas in Qantas’ network, will also work with researchers to design a completely new dining service for the flights. All of this research regarding passenger health and well-being, despite being such a major part of Project Sunrise, is just scratching the surface. Qantas has been working for years to determine what aircraft fits best. When the announcement was first made, Qantas “challenged” Airbus and Boeing to come up with an aircraft that can perform the flights comfortably as well as carry a profitable payload. Airbus initially submitted their A350-900ULR, which Singapore Airlines operates for the current world’s longest flight, however has since pulled the aircraft out of the competition in favor of the A350-1000, which has said to be undergoing development studies for a long rang version. 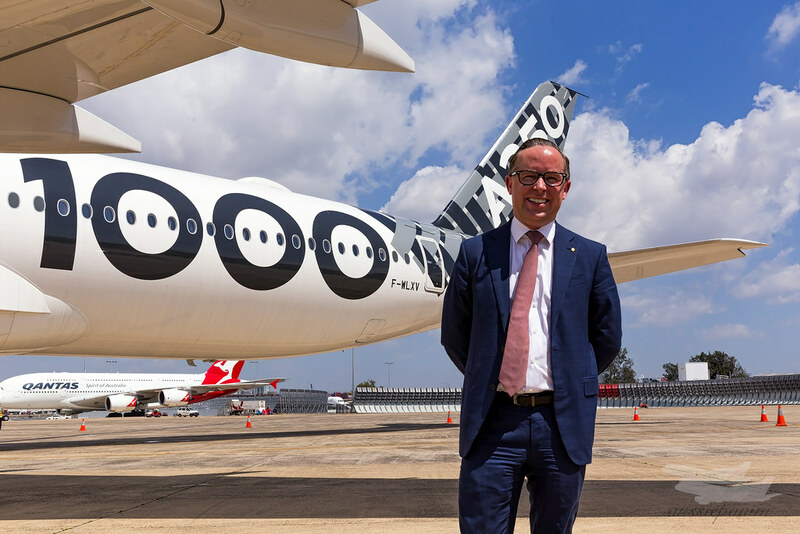 Airbus sent the A350-1000 test aircraft to Sydney during its world tour and Qantas’ CEO, Alan Joyce, climbed aboard for a test flight. Upon landing he stated it was a fantastic aircraft, however Boeing also has a great product. Boeing’s product is the 777X, specifically the 777-8 – the longest range aircraft in the family. Production of the 777-8 is expected to take place in two years, and will see the aircraft undergo a similar test program to the 777-9 that’s nearing rollout. Boeing states the aircraft can operate the flights with room for 300 passengers and range to spare, however the aircraft, which compared to the A350, is a redesign, rather than a clean-sheet design, meaning the aircraft is heavier and doesn’t pack all the features of a new aircraft. Very little has been said about Qantas’ preference so far, however it was rumored that they are in favor of the A350, however with an announcement scheduled for this year, it’s best we wait and see. Qantas is calling Project Sunrise the final frontier of commercial air travel, and with the enormous amounts of time and money being invested in the goal, excitement is already building in the aviation industry. Australia is well known for its limited travel options, mostly due to cost and distance. Non-stop flights from the east coast to New York and London would not only open up new opportunities for Australian travel, but reduce stops and save time, all while encouraging other airlines to investigate ultra-long-range flights. With Qantas being listed as the safest airline in the world and having a track record of being the pioneer for the newest aviation tech, it’s no doubt that Project Sunrise will bring along industry changing products and procedures. Wow, I’m impressed with what Qantas is trying to do. Unlike shameless American Airlines who disregard the feedback what their crews and customers give them. Yes, American Airlines thinks giving their customers less space, fewer toilets, much smaller toilets, and eliminating the inflight entertainment systems is exactly what customers want. Does AA do studies on how to make their customer experience even more miserable?